The snow has melted, birds are singing, flowers are blooming; spring has most definitely arrived! With the warmer weather comes a longing for longer walks, trips to the playground and park, morning trips to the farmer’s market and to just generally be outside. So whether you are carting little ones and their toys, or little ones and bags of fresh vegetables, what better way than by pulling a wagon? The convenience of a stroller, but the carrying capacity of so much more! We’ve brought together a collection of some of the top brands and models on the market to make selecting a wagon easier. To simplify, the wagons have been split into those made of metal, wood or plastic. Metal wagons are made with a steel bed, and no sides, except for the lip on the body. 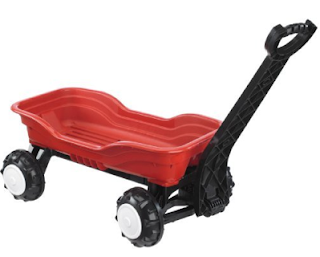 The iconic ‘Classic Red’ wagon($139.99) is probably the most well known of the Radio Flyer wagons. 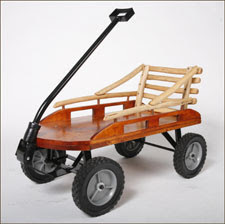 It is simple in its construction, with rubber tires and a weight limit of 150 lbs. The ‘Big Red Classic All-Terrain’ wagon($179.99) pairs the classic wagon with pneumatic tires, resulting in a weight limit of 200 lbs. The ‘Ranger’ wagon($99.99) is a classic wagon with a seat back for child comfort. 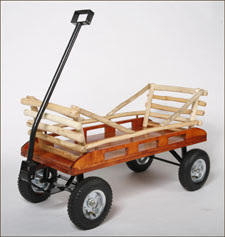 The wooden wagon category combines both wagons made entirely and partially of wood. 1) Radio Flyer – With by far the greatest selection of wagon models, the red radio flyer wagon is a common sight. The wood wagons within the radio flyer line include the ‘Trav-ler’($129) and ‘All-Terrain Steel & Wood‘($179) wagons. 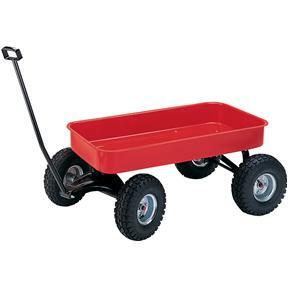 Both of these are the ‘Classic Red wagon’ with the addiction of wood sides, and the ‘All-Terrain’ wagon also has pneumatic tires. Also within the line, the ‘Ultimate Classic wagon’($250) has a metal body with stylish wooden siding, padding in the bed for comfort, drink holders, a removable rear storage bag, a sun canopy and a weight limit of 120 lbs. Both the ‘Town & Country’($170) and ‘All-Terrain Cargo’($200) wagons have solid hardwood bodies, removable wooden sides and weight limits of 150 lbs. The ‘All-Terrain Cargo’ wagon also has pneumatic tires. 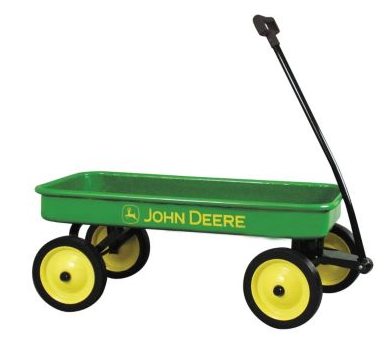 The classic metal ‘John Deere’ wagon is upgraded to include wood sides and pneumatic tires. To be suitable for boys or girls, the metal base is available in green or pink. 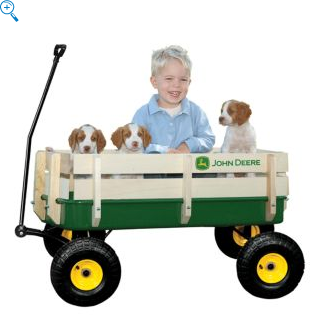 The greatest selection of children’s wagons is in the rugged plastic wagons category. 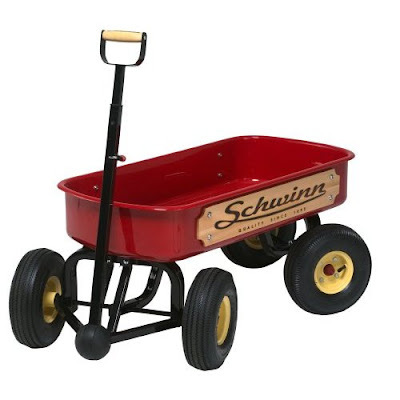 Plastic wagons are generally a single molded body, often with drink holders and foldable seats. One of the main bonuses of a plastic wagon is the ease of cleaning. The ‘Pathfinder’($120) wagon has 2 seats that fold down flat, resulting in 2 wagons in 1. It also includes drink holders, seat belts and a storage compartment. The weight capacity of the Pathfinder is 200 lbs. The ‘Voyager Canopy’ ($140) wagon has all of the same features as the Pathfinder with the addition of sun protection. The ‘Ultimate Family’($170) and ‘Ultimate Comfort’($220) wagons both have 5-way flip and fold seats, seat belts, drink holders and sun canopies. The Ultimate Comfort wagon also has removable seat pads and a removable soft-sided storage bag with insulated compartment. The ‘Outback’($120) wagon also has foldable seats, seat belts, a removable soft-sided storage bag with insulated compartment and a weight limit of 200 lbs. 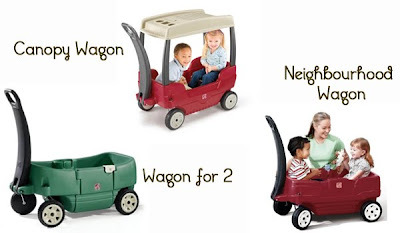 2) Little Tikes – There are 4 different wagons in the Little Tikes line-up. The ‘Cozy Cruisin’($60) wagon features 2 seats with back rests, drink holders, a wet/dry storage area and the handle folds underneath for easy transport. The ‘Adventure’($60) wagon has removable extra-high sides and an extra-long handle that folds flat for easy storage and transport. The front wheels are on casters, resulting in increased maneuverability. The ‘Explorer’($70) wagon features removable sides and a handle that folds flat for easy transport. 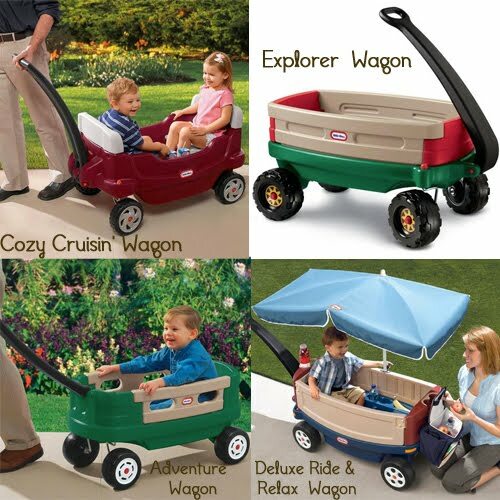 The ‘Ride & Relax’($110) wagon is the luxury wagon in the Little Tikes line. It features 2 flip-up seats, seat belts, drink holders, a covered wet/dry storage area, removable sides and a handle that folds underneath for easy storage and transport. The wagon also converts into a bench that both adults and children can enjoy. 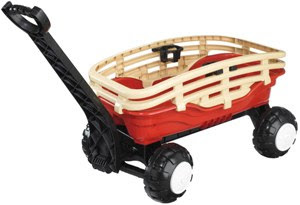 The ‘Neighborhood’($70) wagon in the Step 2 line features seat belts, drink holders, a small storage compartment on the side panel, and a long handle that folds underneath for easy transport. The ‘Wagon for 2 Plus’ features 2 molded seats with seat belts, under seat storage and drink holders. 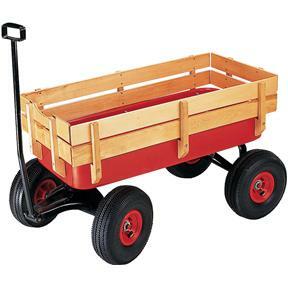 This wagon can be combined with the ‘Tag-Along’($40) trailer for added storage space. The ‘Canopy’($100) wagon has 2 contoured seats with seat belts, drink holders, molded in drain holes, a long handle that folds under for easy transport and a sun canopy. The weight limit for all Step 2 wagons is 75 lbs. 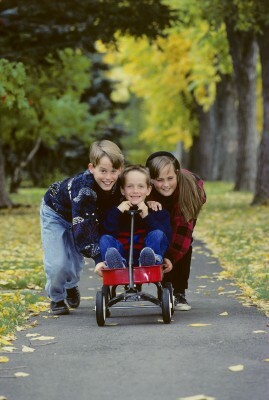 The ‘Runabout’($40) wagon holds 2 children with a combined weight of 84 lbs (max). The handle folds underneath for easy transport and storage. The ‘Deluxe Runabout Stake’($40) wagon is the same as the Runabout, with the exception of having stake sides. 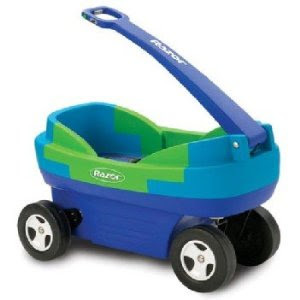 5) Razor – Although plastic, the Razor adds another element to their wagon. The ‘Razor Electric’ wagon($100) has dual 65-watt motors, forward and reverse drive and movement speeds up to 3 mph. It also has 2 built-in seats, drink holders, drain holes, a folding handle and a detachable sun canopy. The weight capacity of this motorized wagon is 145 lbs.